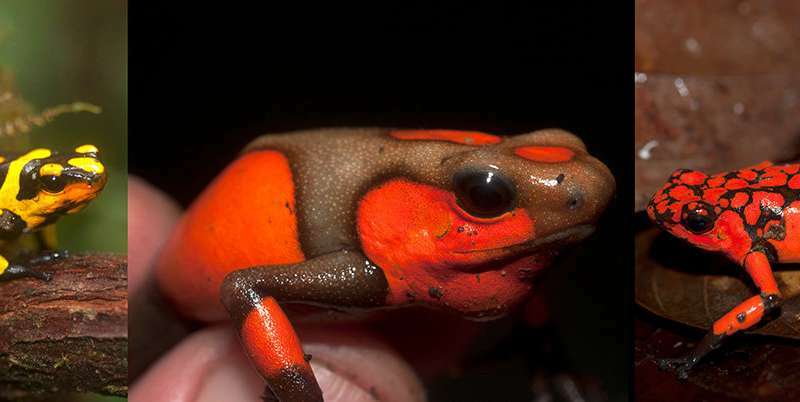 By studying more than 300 dart frogs, the researchers have found that two existing Oophaga frog species actually "hid" three additional groups, and that there are actually a total of five species. "Our finding is crucial to study life diversity," said Andrés, biology professor in the U of S College of Arts and Science. "Some species may disappear even before we have the chance to study them." The three new Oophaga frog species, which the researchers have named anchicayensis, andresi and solanensis, stand on their own because of their genetic differences from existing groups. They also show unique colour patterns and size, and live only in certain areas of the northern and northwestern Colombian jungle. Colombia is a hotspot for frog populations in general, with around 800 species—a staggering 17 per cent of around 4,600 known frog species in the world. Canada doesn't even reach one per cent. 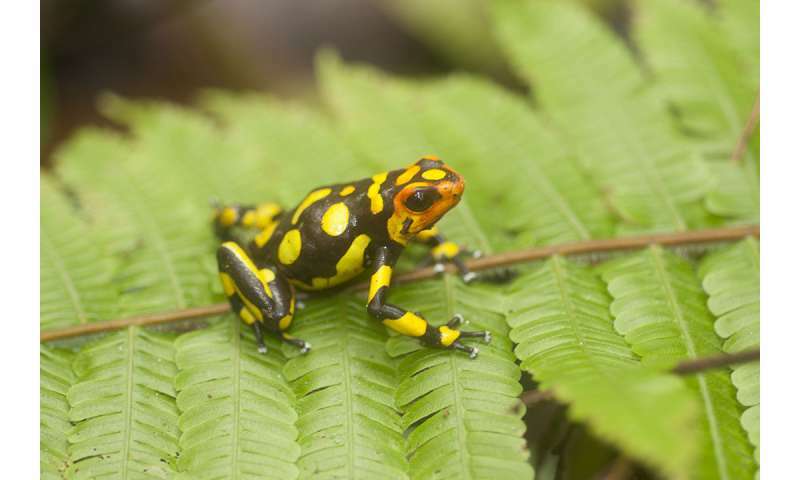 The researchers' modern identification approach, which integrates the study of genetics, colour patterns (morphology), and ecological information, has helped them debunk a previous 1976 study that reported the existence only of two dart frogs species—Oophaga histrionica and Oophaga lehmanni. Because it was considered a large group, histrionica frogs were labelled at the time as a "least concern species" in the Colombian government's conservation list, while the less numerous lehmanni frogs were listed as "critically endangered." "The government has worked hard on developing conservation programs that have actually helped lehmanni frogs escape extinction," said Posso-Terranova. "This means conservation strategies work." He notes that naming new species is the only way for Colombia to include animals in the list of endangered species. "If we don't know new species exist, how can we protect them? Naming and identifying new species is like currency for conservation policies," he said. Andrés and Posso-Terranova's discovery might also help put the brakes on the illegal pet trade that threatens the survival of dart frogs. The animals are often sold for more than $2,000 on the international black market because of their beautiful bright colours that mix black with a variation of yellow, orange or red, along with their "dangerous" appeal. The frogs are traditionally used by Colombian Indigenous hunters for poisoning blowgun darts. The poison, which the frogs produce because they eat toxic bugs, is harmful to humans only if it enters their bloodstream. 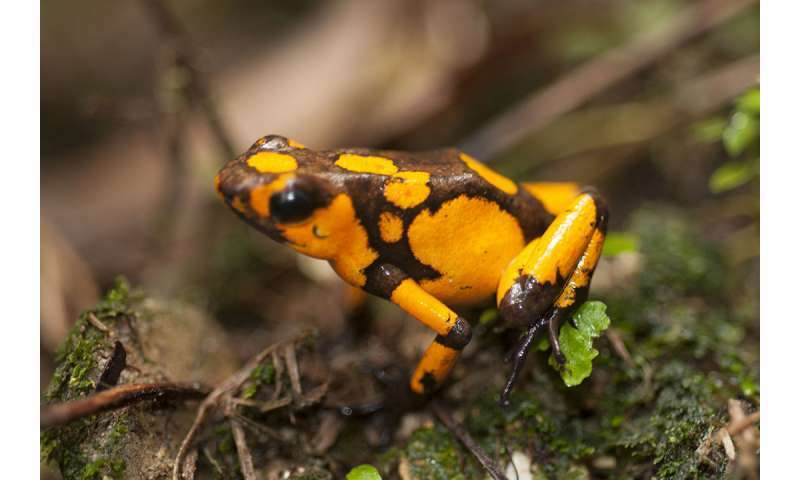 "With new policies in place, the government could help poor local populations, who make a living off illegal frog trade, start alternative business such as cultivating flowers or cocoa beans," said Posso-Terranova.